Chris here with a brief entry... We spent Thursday relaxing and taking in some of the sights. Kristen spent almost the whole day with the kids at the Science Museum which is a few blocks away from our slip. I spent a few hours there, but my back started to hurt a lot a couple of weeks ago and has been getting progressively worse, so I took off early. I'm hoping it's just muscles. We started in on "The List" yesterday. What's the list? 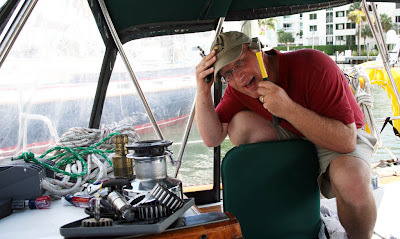 Every boatowner has one - it's everything that needs to get done. In our case, the list was comprised of: Sand and paint the handrails/caprails/rubrails; Sew a lee cloth for the kid's pillows; Sew bumper covers; Pull apart, fix and lube our winches; Put new sealant on our deck (HUGE job); Resew dodger cover; Mark all gauges at normal levels; Investigate why our fridge temp reading is wrong; Make curtains; Replace halyard; Add new lines for third reef; Install batteries; Install new inverter/charger; Install cockpit shower; Provision for two months; Buy engine spare parts; Buy beef jerky (yes, yes, I know, but it's on the list! ); Buy snorkeling stuff; Order satellite phone; Get weather router; Install padeye on dinghy for lock; Replace broken studs on enclosure; Sew sail cover for lazy jack access; Install Sirius weather on chartplotter; Fix cabinet where we installed new vented loop; Install water filter; Plan Bahamas section of cruise. A few days ago we installed the water filter (cheap whole house filter from Home Depot along with a carbon insert for taste - now we can drink the water from our water tanks! ), and then we started on the rest of the list yesterday. I rebuilt the winches (yes, I did it, which for those of you that know me is amazing and weird at the same time - my strongest ability is finding someone else to do this stuff for me! ), put a coat of stain on the grabrails and did a couple of other odds and ends. Kristen sewed the kid's lee cloth for their pillows (using the sunbrella we found in the trash at Vero Beach, cleaned up of course!). 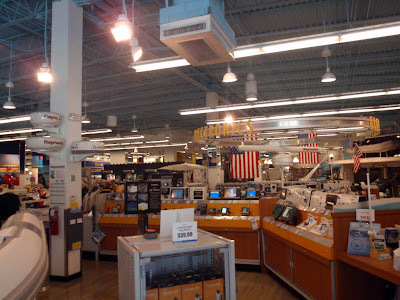 Today, I ran to the Fort Lauderdale West Marine Superstore (the largest West in the country) for a bunch of stuff while Kristen put a coat of stain on all the wood and sewed the new bumper covers. I'm not sure what we're going to do tomorrow yet. Tomorrow evening we're going to rent a car to have all day Monday, and we're going to pick up our new Xantrex charger/inverter, buy the beef jerky, get snorkeling gear and do all of the other errands we need a car for. Tuesday afternoon we have a contractor coming over to help install the batteries and inverter (we need a bunch of new, really big cables put together), and also to help run the cables for the weather hardware. By the way, for those of you that care, we bought 4 Mastervolt AGM batteries. Each one is half the size of an 8D battery, weighs 115lbs and has 200AH of power. We'll have 800AH of power on Pelican. For those of you that have no idea what I just said, basically we're doubling the amount of power on the boat but not using up any additional space. We're hoping to be done with this by Wednesday, and to be able to head to Noname Harbor in the keys on Thursday to be positioned to head to the Bahamas! I'll post more in depth stuff soon.